By late morning the gloomy skies had brightened up sufficiently for a Sunday afternoon walk so, after a quick lunch, we drove over to Dufton. 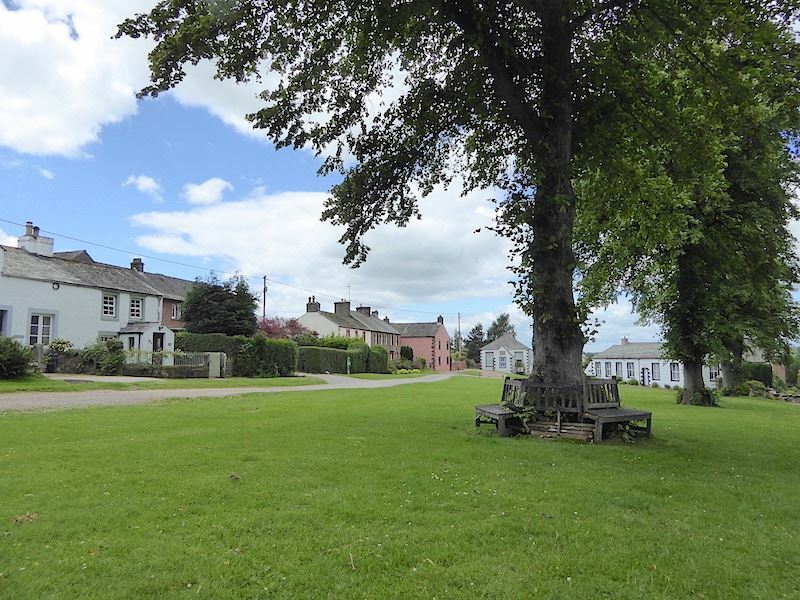 The village, which nestles at the foot of the north Pennines on the eastern side of the Eden Valley, is only a twenty minute drive from home and is a good base from which to begin quite a number of walks. 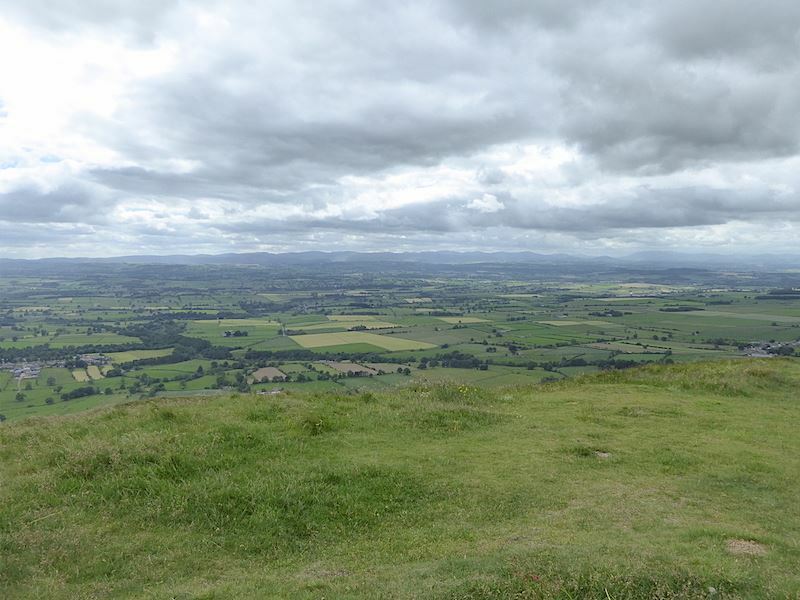 Today we decided to take a walk up Dufton Pike which stands at 1578′ above sea level. The heat of recent days has gone so the shorts and sun cream are back in their respective cupboards for the time being. 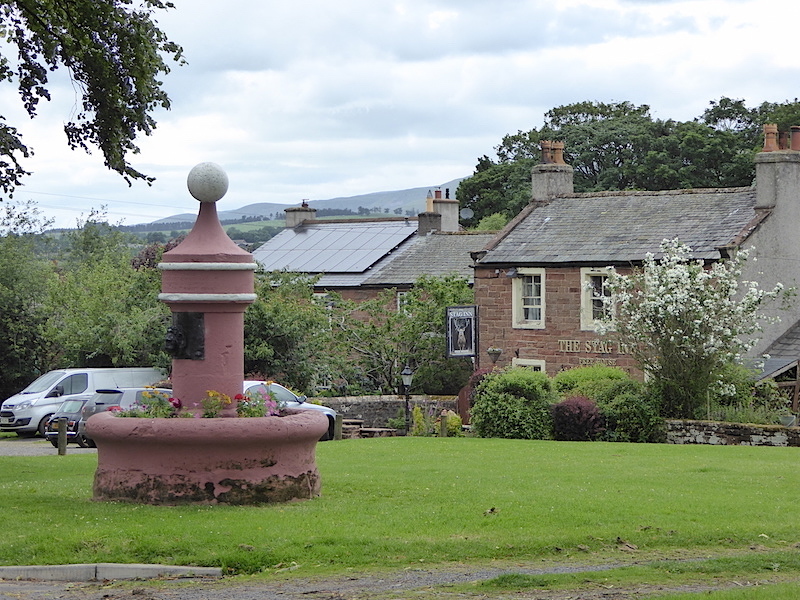 Dufton village green from our roadside parking spot. Although we didn’t know it at the time, we had just been pipped for the last space in the car park, further back up the road, by another driver who turned into it just ahead of us. As soon as we turned in we could see him parking up with no sign of any other space. Nothing for it then but to back out, its not a big car park so there was no room to turn around in it, and drive back down the road to see what was available. Quite a few cars were parked on the road side but we slotted in without any difficulty. Its Sunday lunch time and the Stag Inn, out of shot across the road to the right, serves meals, so it that probably explains the large number of cars at the road side and in both the pub car park and the public one. Having got our gear together we set off and follow the road down and out of the village. 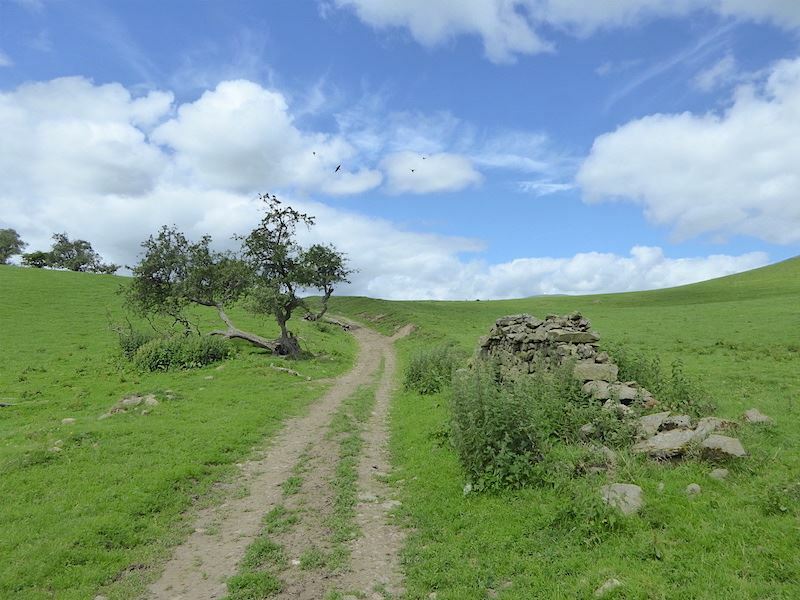 We continue to the bottom of the hill where …..
….. we leave it and branch off to the right along this wide track heading towards Coatsyke Farm, as indicated by a small sign in the grass verge on the left. From the track we get our first view of Dufton Pike, less cloud and more sunlight would have helped to show it off a bit better. 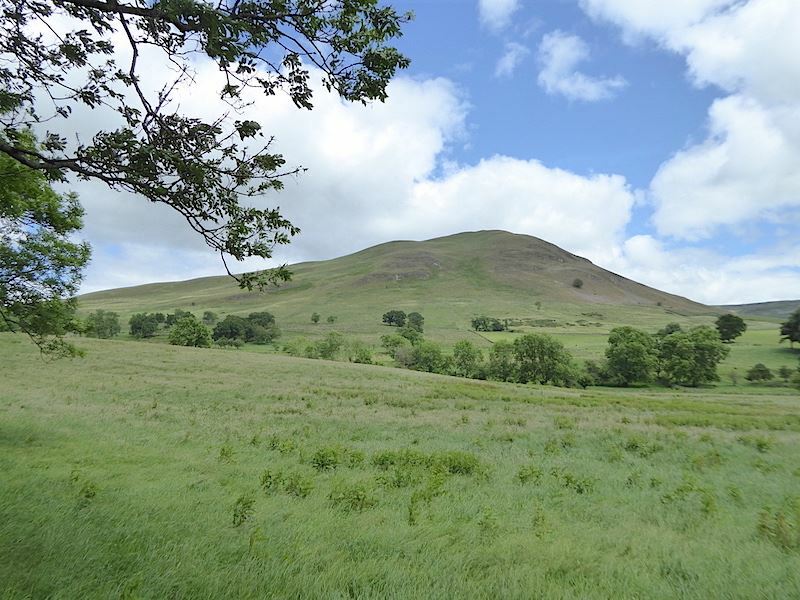 It doesn’t look it but it is higher than thirty three of Wainwright’s Lake District fells and exactly the same height as Gowbarrow Fell. A look back after we pass through the gate at Coatsyke Farm. 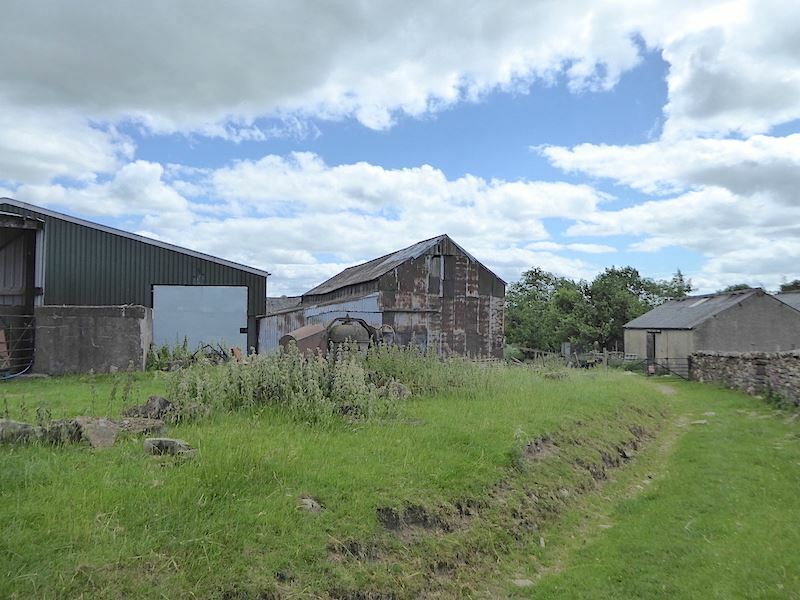 There are a number of scruffy farms in the Lakes but this one could have given them a good run for their money. Old and rusting machinery chucked everywhere and all the buildings, with the exception of the newish barn, looking very run down and uncared for. Beyond the farm and about to cross the stile. 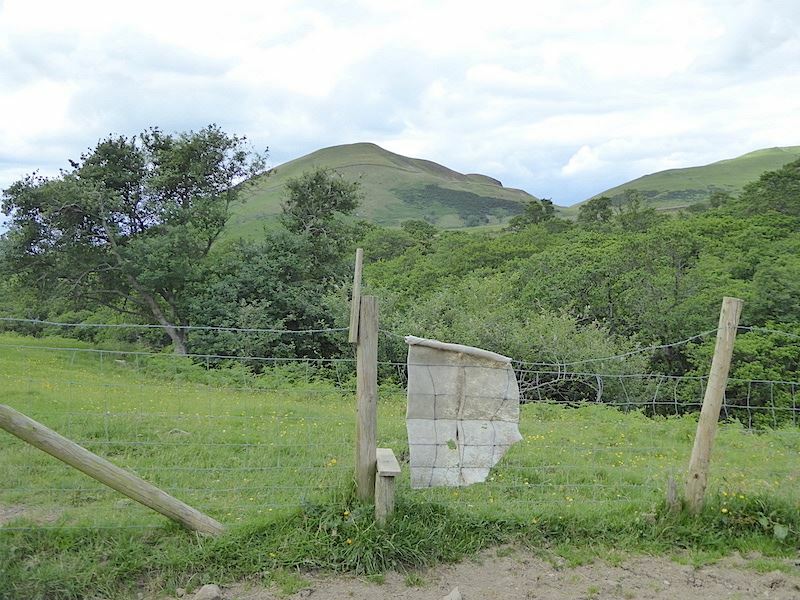 There was a metal gate beside the stile which we could have used instead, but it was quicker just to hop over the stile than faff about with stiff and unwieldy gate latches. 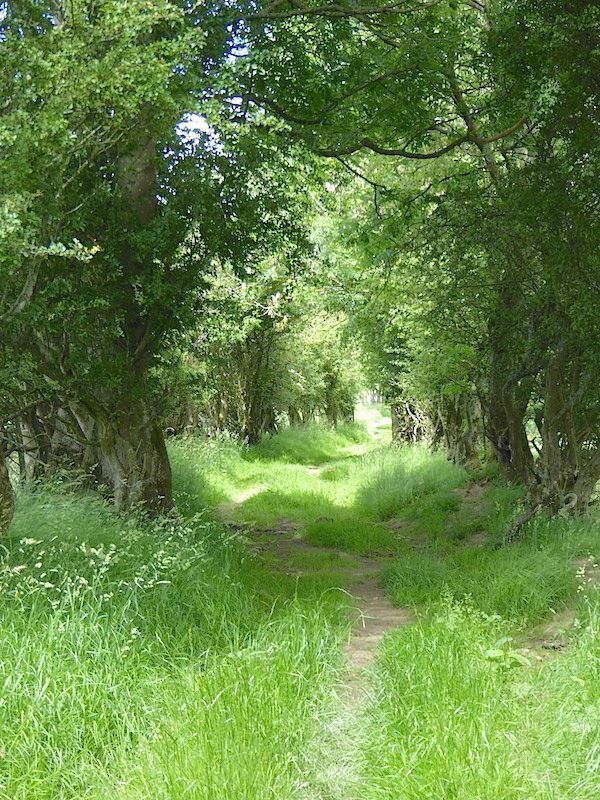 The route went through the charming tree-lined Hurning Lane which was just lovely to walk through. 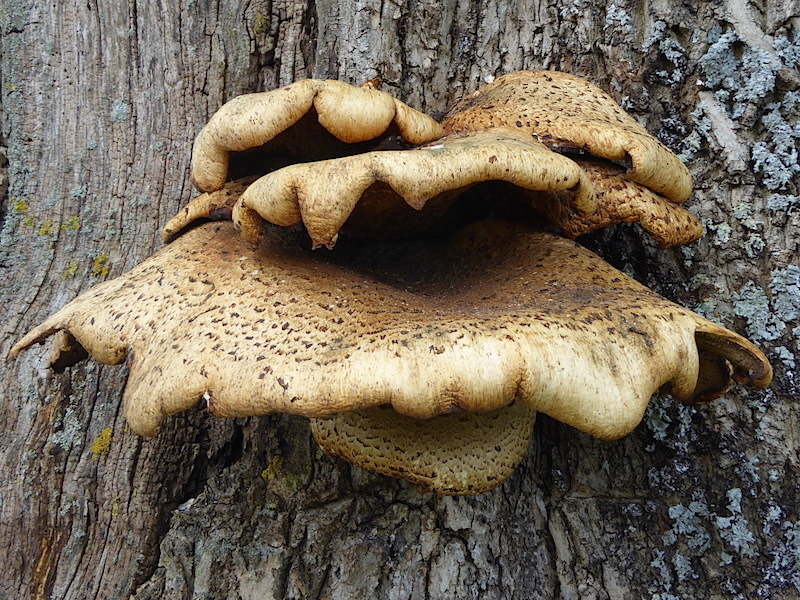 I had feared that it might be very muddy but the recent strong winds have obviously helped a great deal in drying everything out. Here and there along the lane the gaps in the trees offered us glimpses of Dufton Pike on our right. The views of it changing ever so slightly as the lane traverses the lower fields. The gradient is almost imperceptible but nevertheless we are climbing. Further along the lane and another break in the trees offers the chance to take in the view on the left side of the lane. 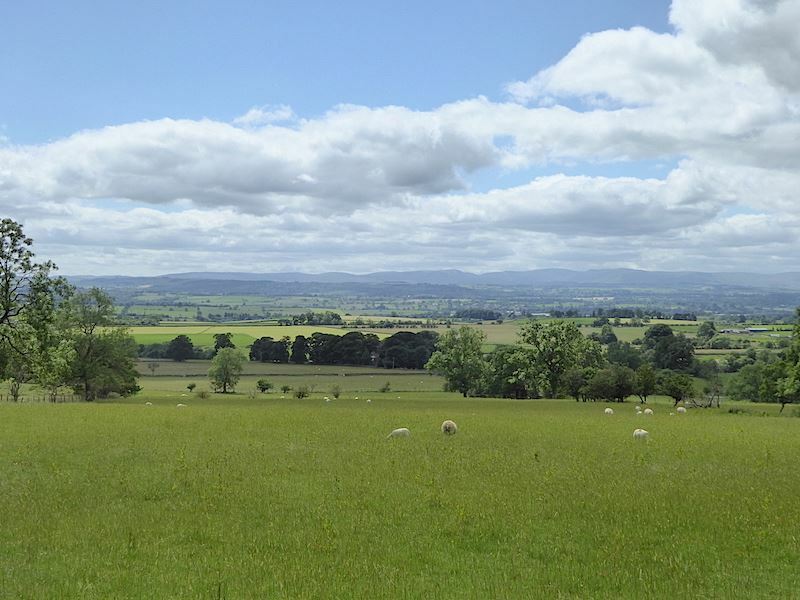 A view straight across the Eden Valley with the High Street fells on the distant horizon. 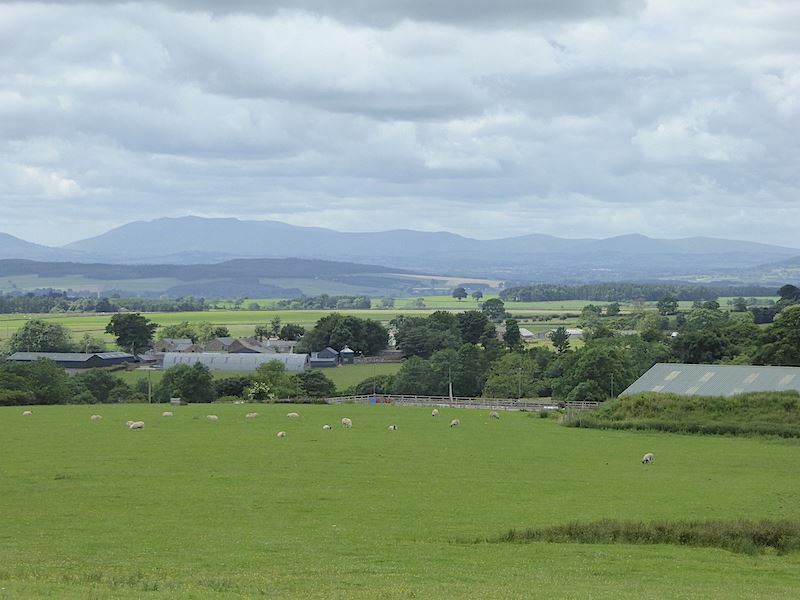 The long distance views were hazy so I took a close up and now the distinctive shape of Blencathra becomes more conspicuous over to the left of the skyline, with the rest of its northern neighbours stretching along to its right. 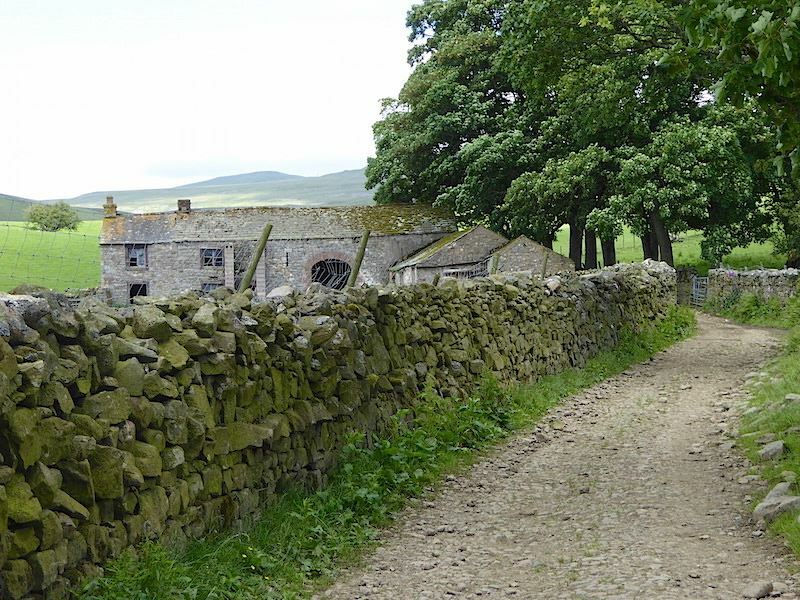 The tree lined lane comes to an end at the abandoned farmhouse at Halsteads. 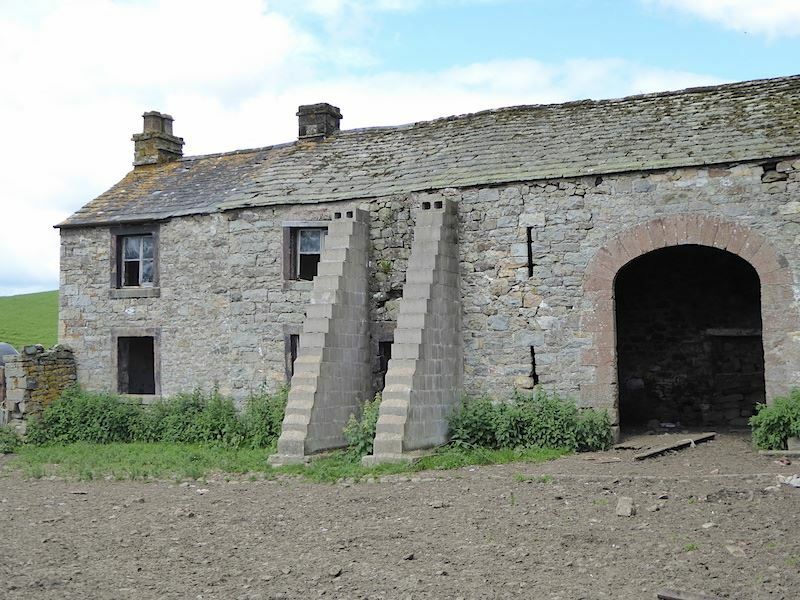 A closer look at the farmhouse reveals the reason for its abandonment despite what looked like determined attempts to prevent it collapsing. There were signs though that the place hasn’t been completely neglected, odds and ends were still stored around the place and signs of animals having been in the yards, so maybe there’s a new farmhouse nearby, and this area comes in handy for general farming use every so often. 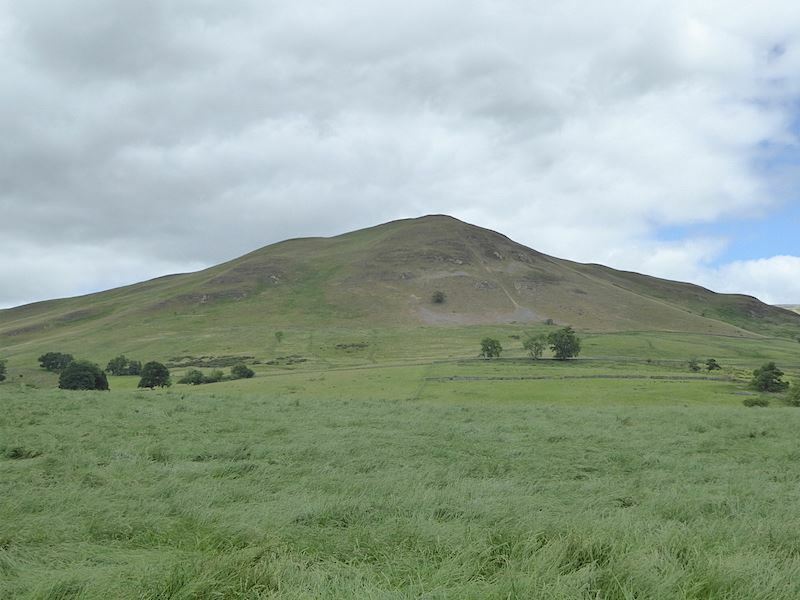 Another view of Dufton Pike from Halsteads which is quite different to the one we were seeing earlier on in the walk. 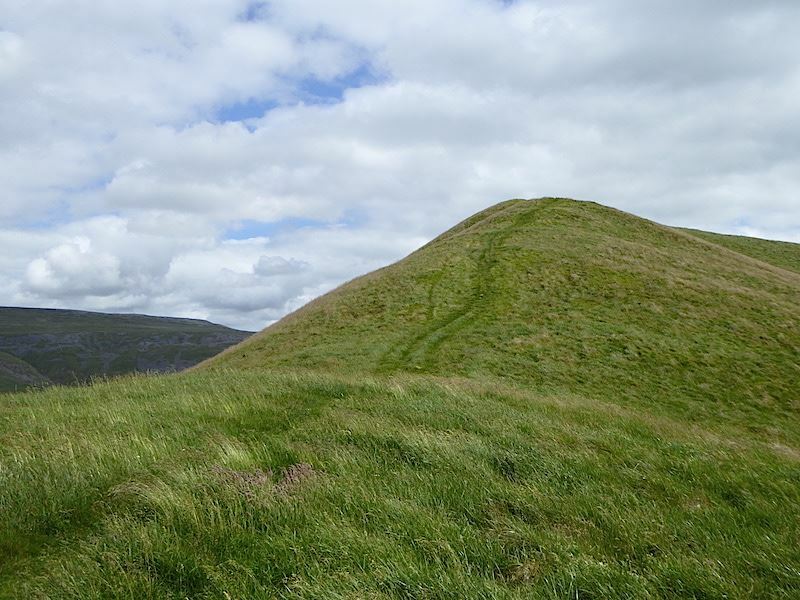 To begin with it looks more or less conical in shape but at this point we can see the long grassy north western slope, interrupted only by the two field walls over towards the left. 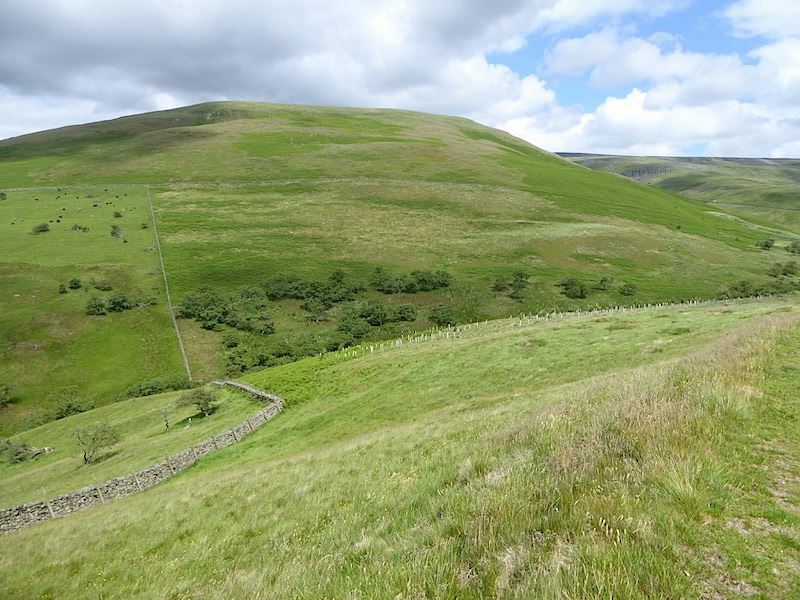 The route we are using will eventually bring us out alongside the higher wall from where we’ll turn up to walk the ridge, which is not as flat as it seems, to the top. No more tree lined avenue now as we climb the still gentle gradient from Halsteads up Cosca Hill. 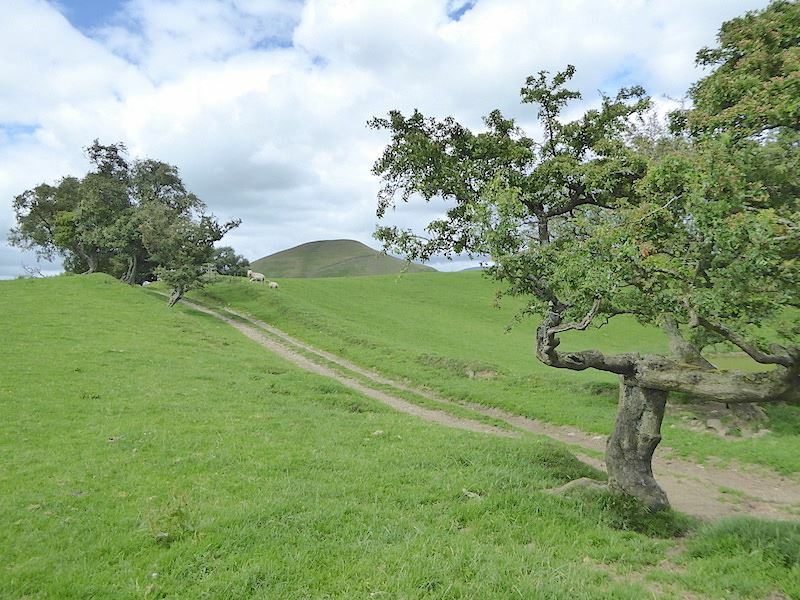 There was a handful of wind sculpted hawthorns but not enough to provide any sort of wind break, so the land is open to the elements and we now had the strong wind coming straight at us across the Eden Valley …..
….. all of which means that we’re going to be blown sideways when we begin to walk the Dufton Pike ridge. 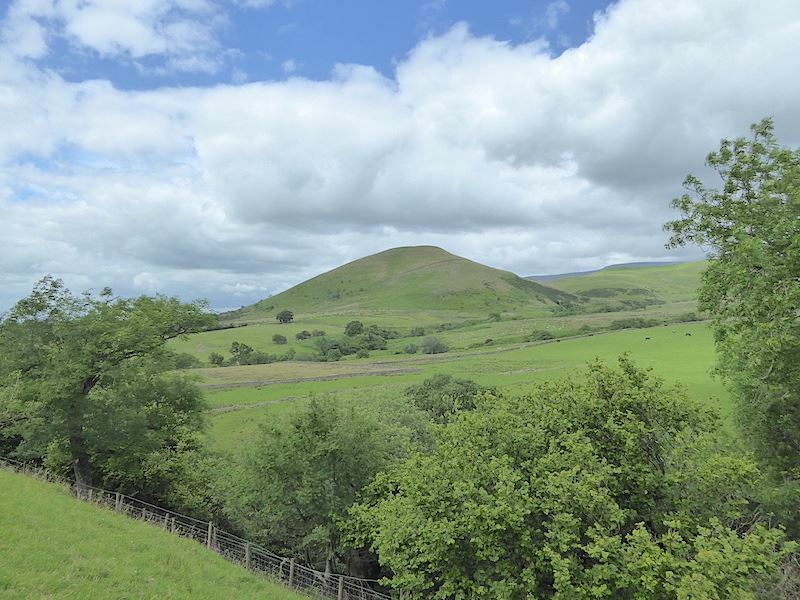 Further along Cosca Hill and Knock Pike begins to appear beyond the brow of the hill. 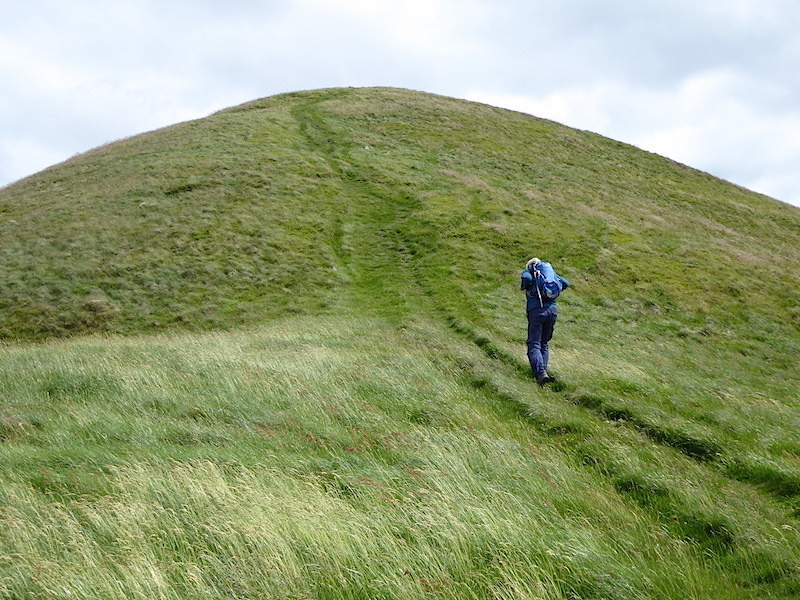 A look back as we reach the crest of Cosca Hill, with Dufton Pike’s long, grassy ridge on the skyline. Looking the other way from Cosca Hill we can now see all of Knock Pike. 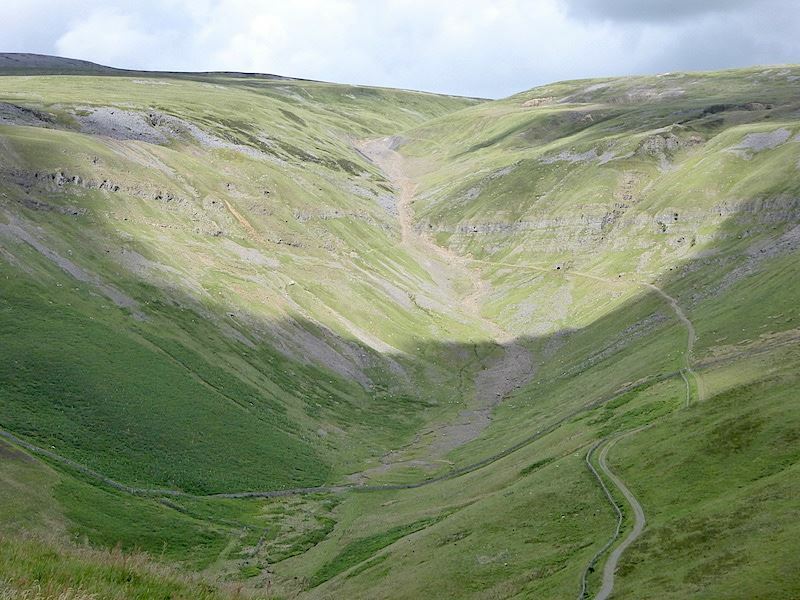 Its situated at the end of, and right at the bottom of Knock Fell, but yet stands apart from it. 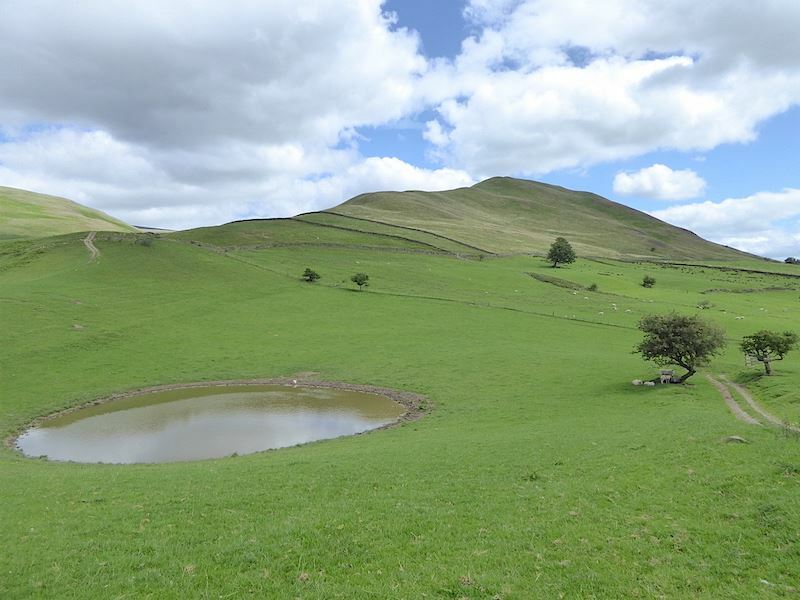 Its almost seems as though Knock Fell wanted to end with a big full stop rather than just insignificantly petering out into the Eden Valley. 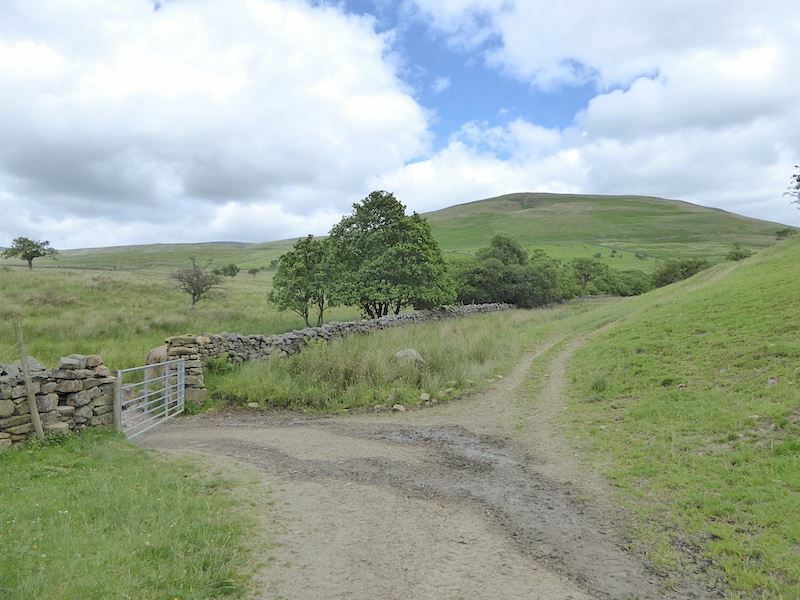 The Pennine Way path carries on beyond the gate and continues on its way up Knock Fell and then over to Great Dun Fell and Cross Fell. 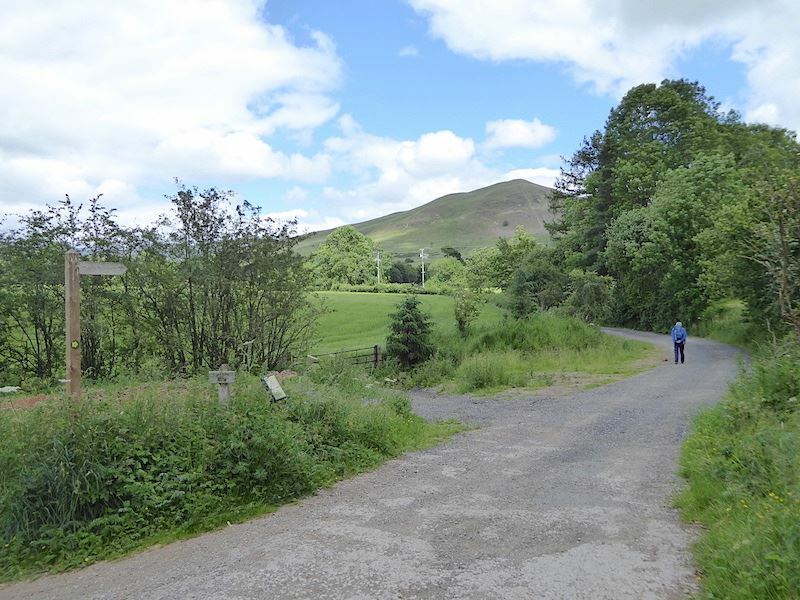 We keep on the path going towards the right of the shot around the foot of Dufton Pike. Having climbed gently from Dufton and then dropped down again we are now at the lowest point above sea level of our walk. From here the only way is up, not that we’ll notice it very much for a while. 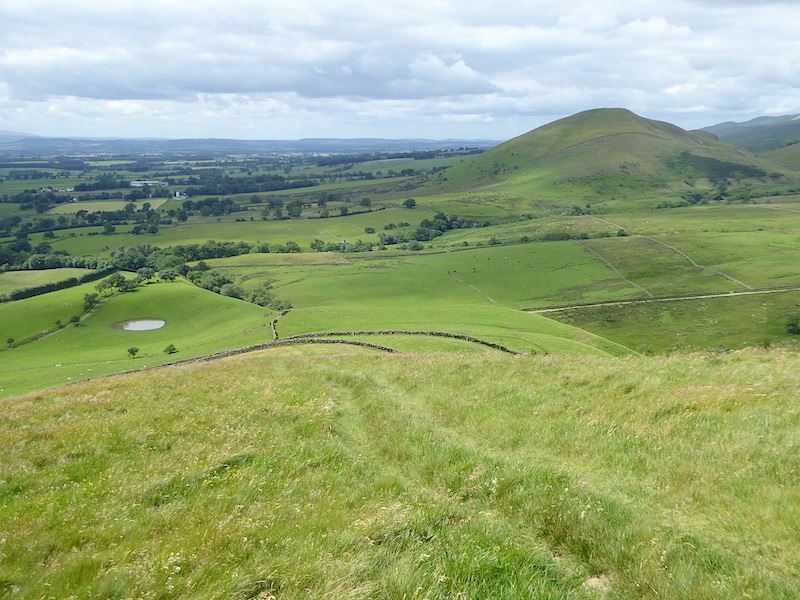 Having rounded the foot of Dufton Pike we are now walking the path in the lee of its eastern slopes and are beginning to be less wind battered as a result. 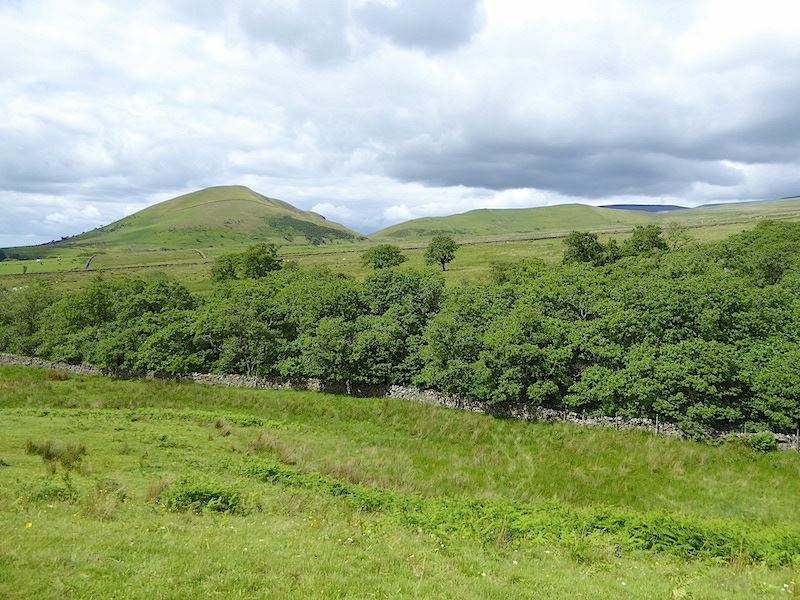 Great Rundale Beck is flowing through the old oak coppice in the centre. 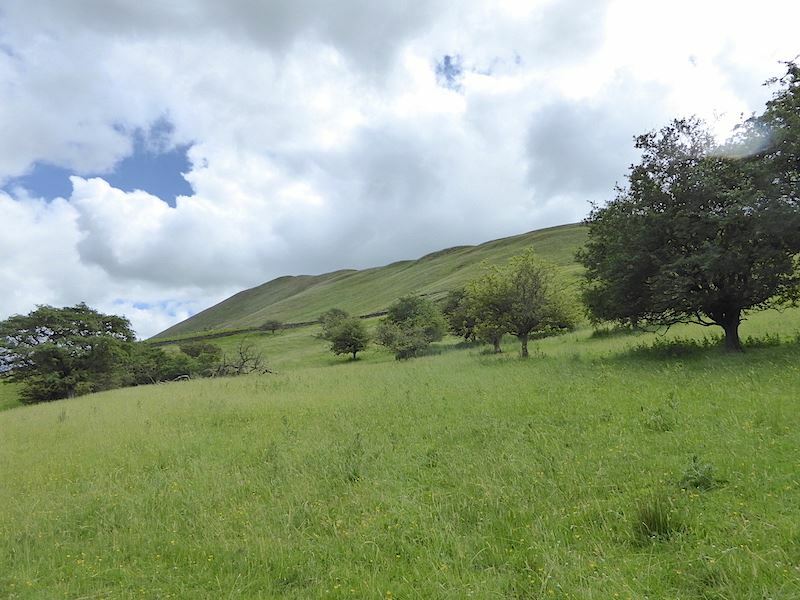 Beyond the coppice is Knock Pike with the lower slopes of Knock Fell rising to the right of it. Another stile at a wire fence, the top strand of barbed wire being wrapped with an old piece of fleecy material to protect the legs of anyone using it. There was also a gate so we used that instead. Just a few paces further on was this step stile in the stone wall, somewhat superfluous at the moment since the gate was damaged and we simply walked straight through. 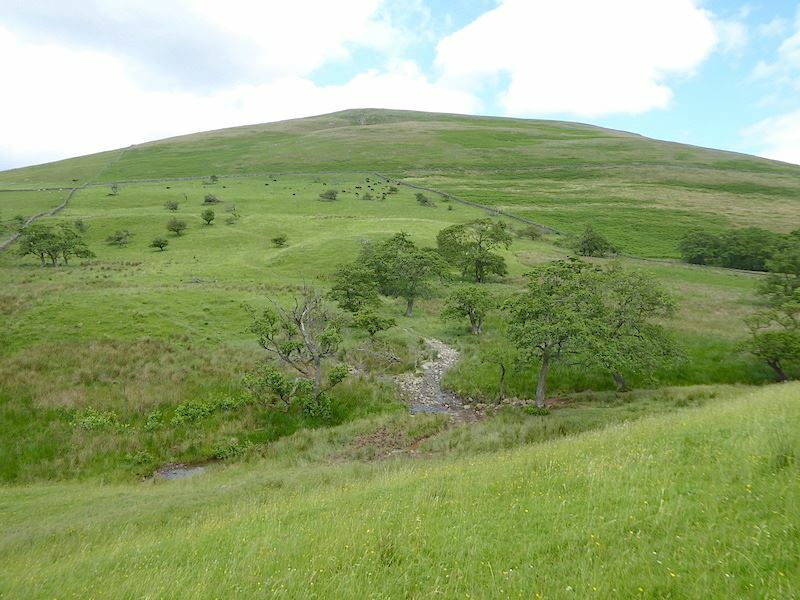 Walking across to the next stone wall and we have Brownber Hill over on our left with Great Rundale Beck flowing below it and us. Crossing the grassy meadowlands on the eastern side of Dufton Pike and up ahead is the next stone wall we are heading for. 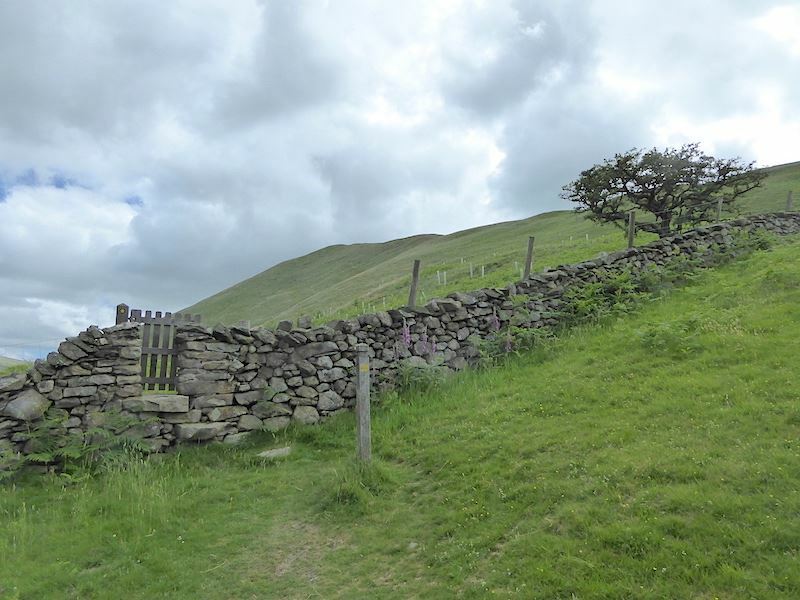 There isn’t a path as such, but the way has been trodden so it wasn’t too difficult to head straight for …..
….. the gate stile in the wall. 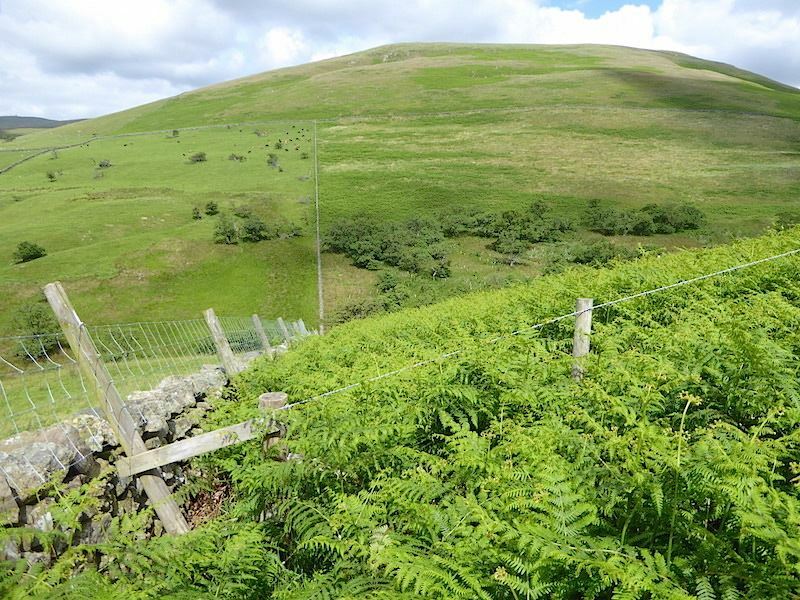 Once through it we take an immediate turn to the right and head uphill alongside the wall …..
….. for a steepish climb through waist high bracken up to an awkward little fence crossing. 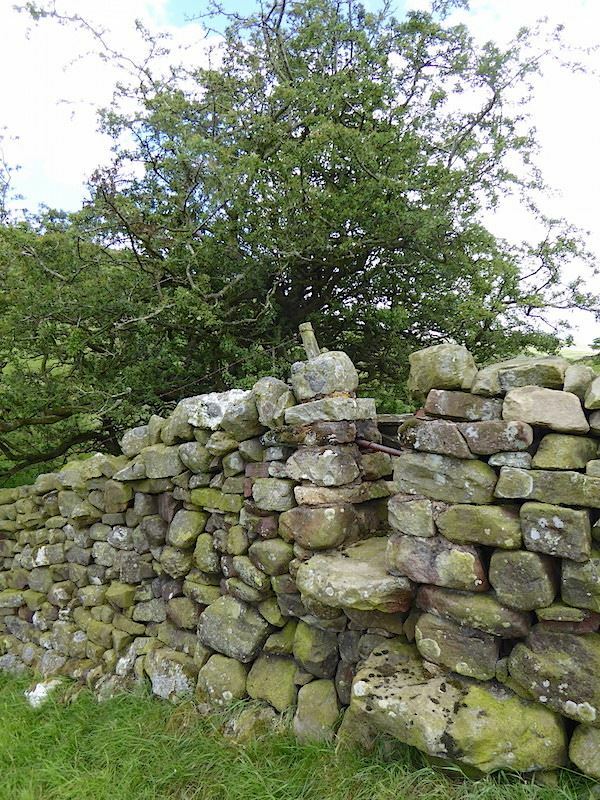 Its not exactly a stile, more of a gap between the wire fence and the wall, across which had been placed a couple of pieces of wood just to give a foothold for anyone needing to cross over. I made good use of the wire fence topping the stone wall to drag myself through the bracken, there have been times when I have been known to disappear amongst this stuff because it can grow taller than I am. 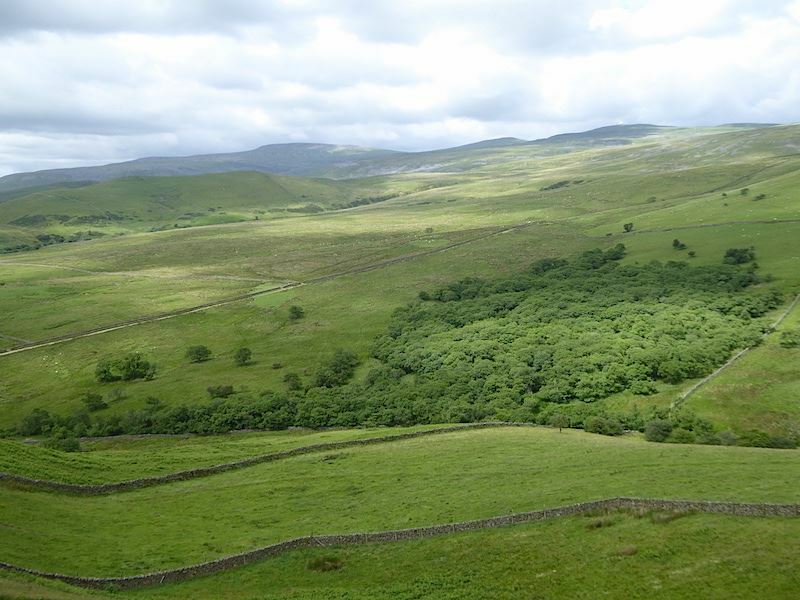 Its only a short stretch of bracken though and soon gives way to grassland again. 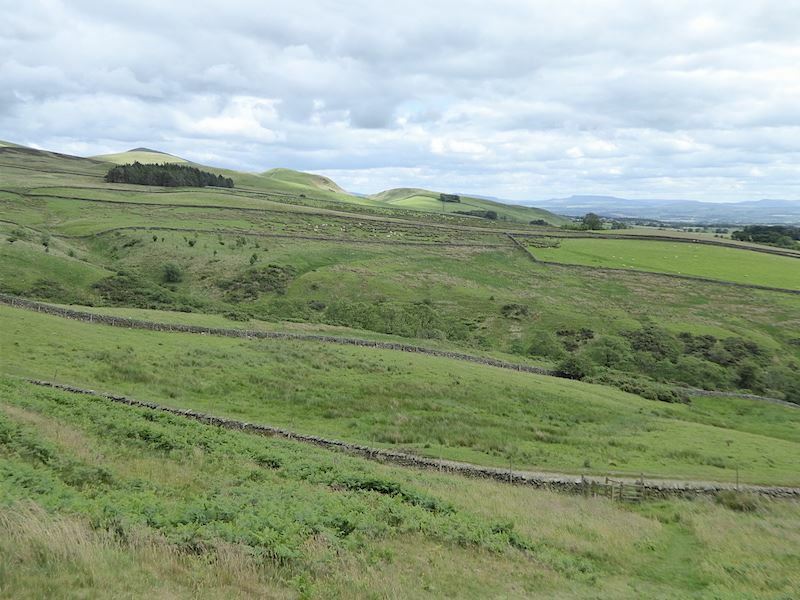 From the wall we continued up the slope to reach the wide grassy track on which I’m now standing to take this shot of Brownber Hill on the opposite side of us. As I turned round to continue the wind very nearly whipped my visor clean away. If it hadn’t been securely pinned to my head with a couple of grips it might have ended up over there on Brownber Hill. 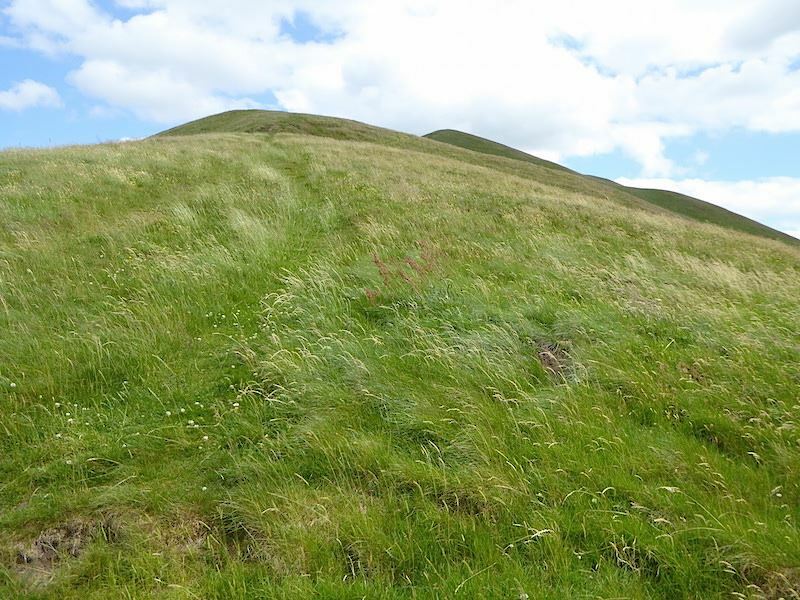 The grassy path contours up and around the north western end of Dufton Pike and we eventually reach the point where we have to turn sharp left up the ridge. We are now directly in the path of the strong wind steamrollering us from due west across the Eden Valley. Its a steep climb but you do get a short break from it every so often as flatter shelf like sections occur between each of the individual rises. A look back from the first ‘shelf’ across the old oak coppice, beyond which a straight diagonal path going from left to right can be seen. 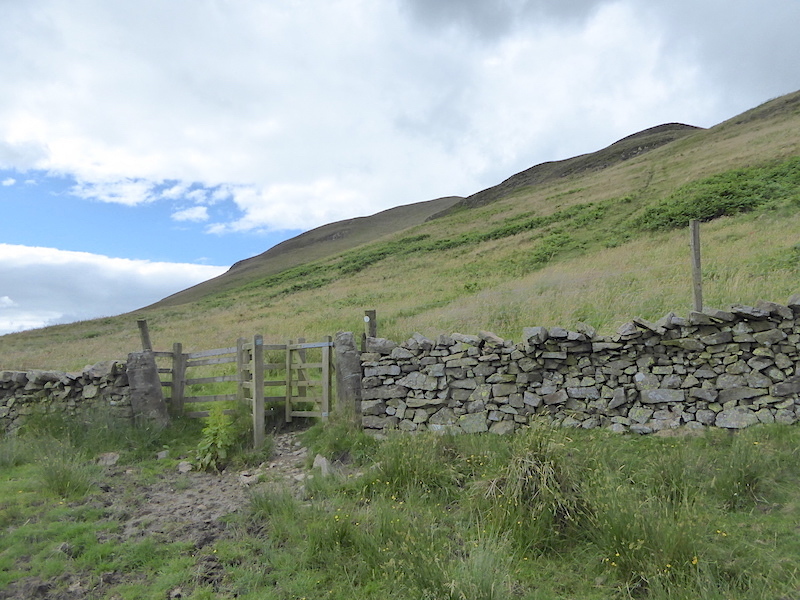 That’s the Pennine Way path I mentioned earlier continuing on from the gate and on up Knock Fell. 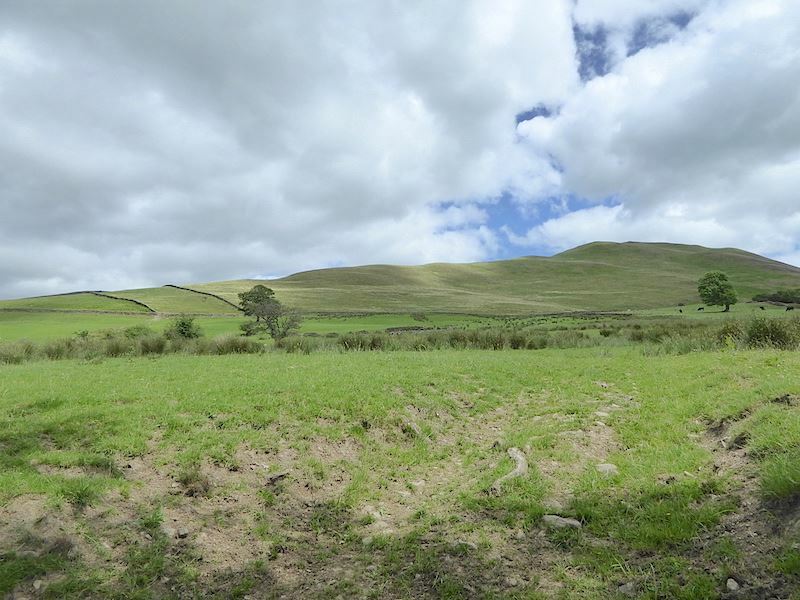 On the skyline are Cross Fell, just left of centre and to the right of it are Little Dun Fell and Great Dun Fell. 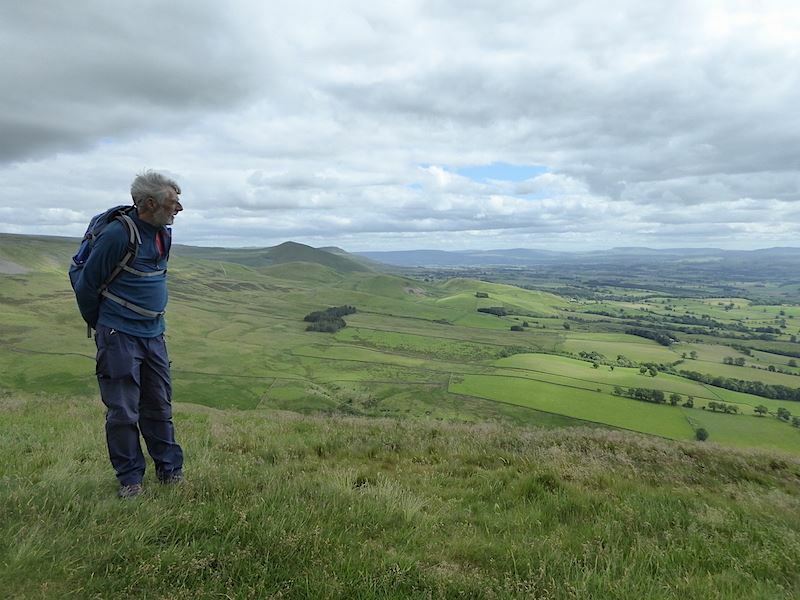 Another look back from the second ‘shelf’ for a view of Knock Pike with the Pennine Way between it and us. Onwards and upwards we go, battling to keep our balance as the wind whips across the Eden Valley and does its best to push us over. 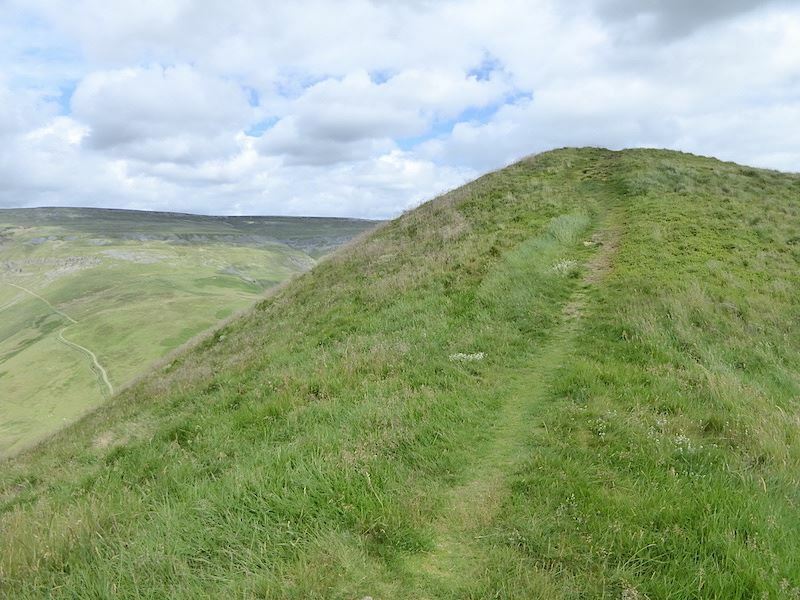 That’s not the top since two higher points are visible behind the first one …..
….. neither is that ….. 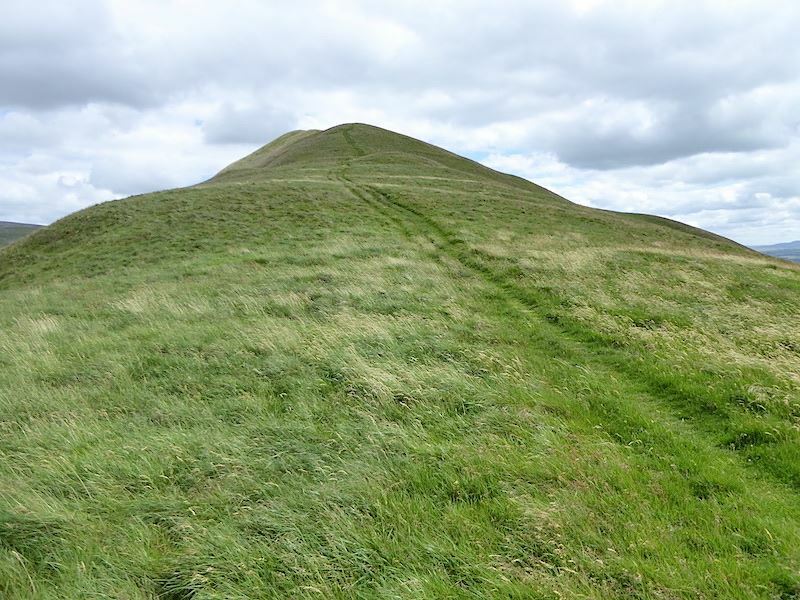 The summit is only a grass platform, unadorned by anything remotely resembling a cairn, not even a single stone. 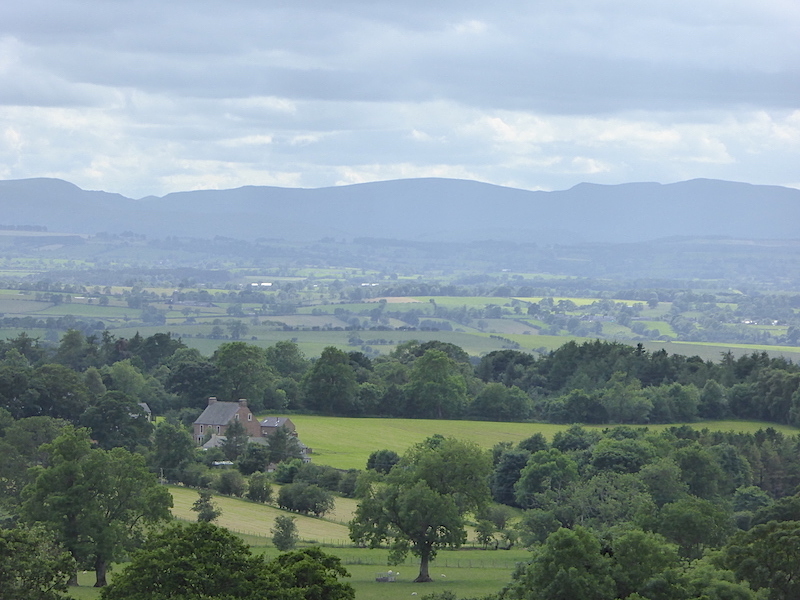 There’s a good long distance view though, across the Eden Valley with the Lake District fells on the distant skyline. Our house is somewhere across there in the valley. Its now feeling quite chilly because the clouds have ganged up to keep the sun out and there’s no let up in the wind speed. From the lowest point up to the summit we have climbed just a couple of feet shy of 1000′ so we have some good all round views to take in, although a bit more sunlight would have helped to brighten things up a bit. Looking across to Cross Fell from the top of Dufton Pike, my trousers weren’t half rattling against my legs and the visor is pulled well down over my ears and forehead with the velcro fastening as tight as I can get it. Even then it was touch and go at times. 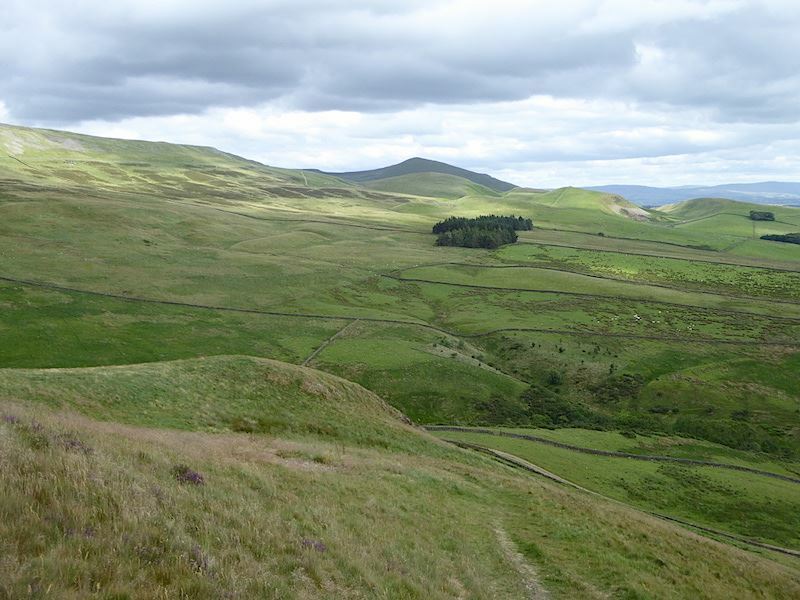 There’s a great view into Great Rundale and its limestone scars from the top of Dufton Pike too. 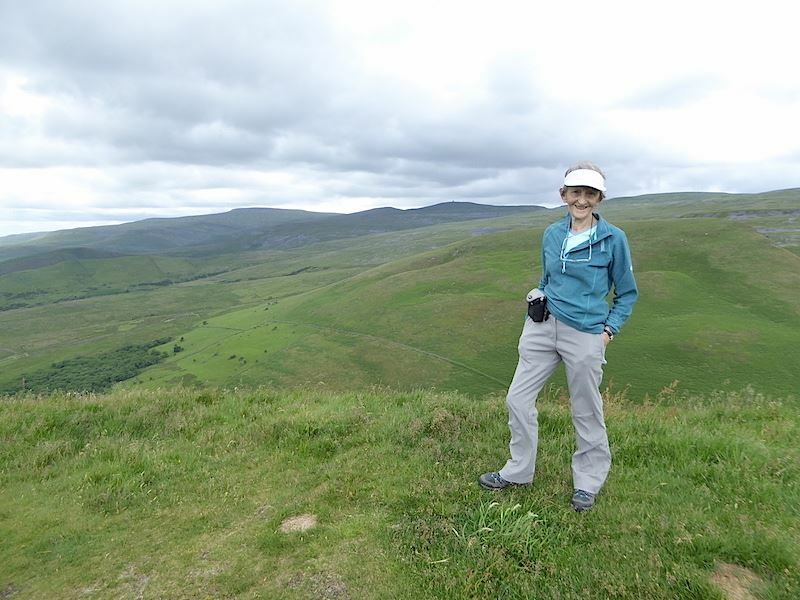 A great deal of mining for minerals and limestone quarrying has taken place up there in the past and there’s an old road leading up so maybe we’ll do a bit of exploring up there some time. 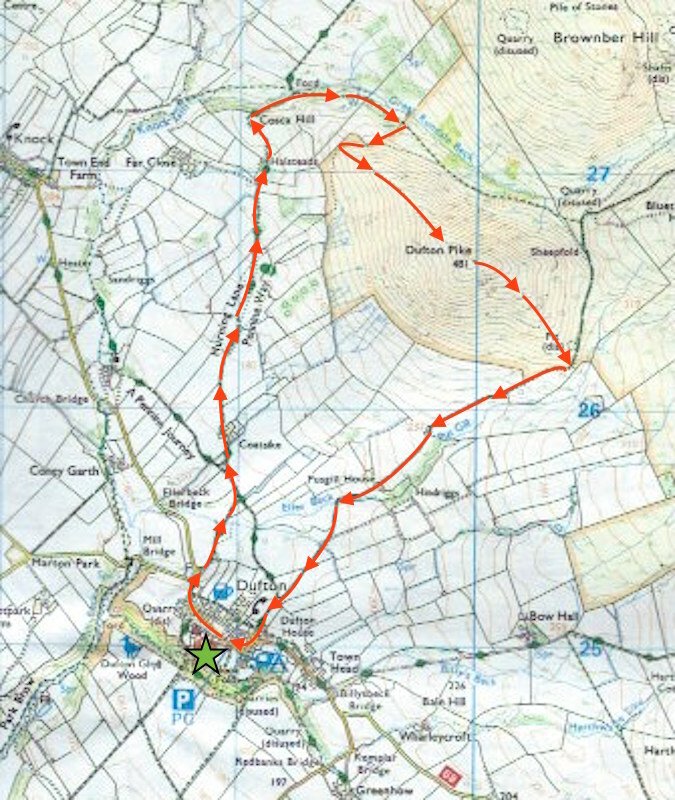 It looks like it might be a very interesting walk with a visit to Great Rundale Tarn at the end of it. The weather closed in for a while as we began to make our way back down and it became quite chilly so the jackets had to go on, and I even thought about putting my gloves on because my fingers were beginning to feel quite numb in the now chilly wind. I compromised by shoving my hands in my pockets instead. 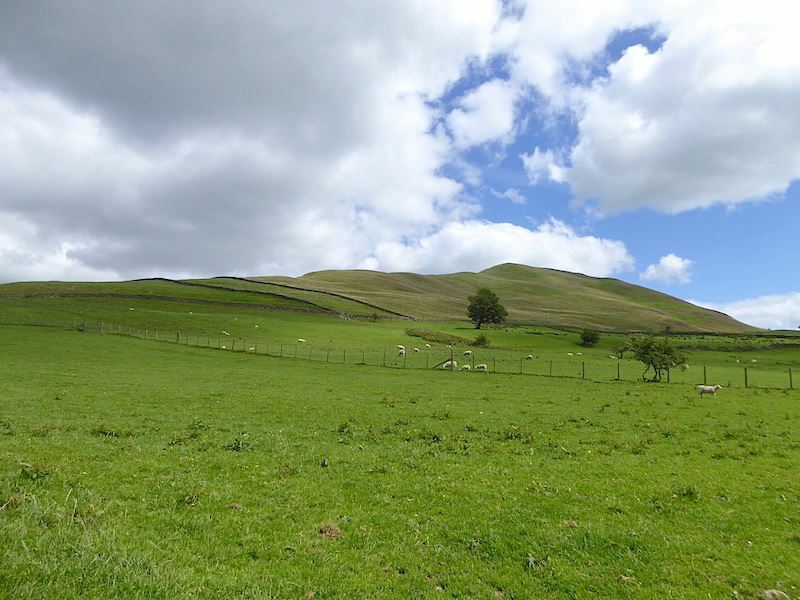 The dark shape on the centre skyline is Murton Pike. 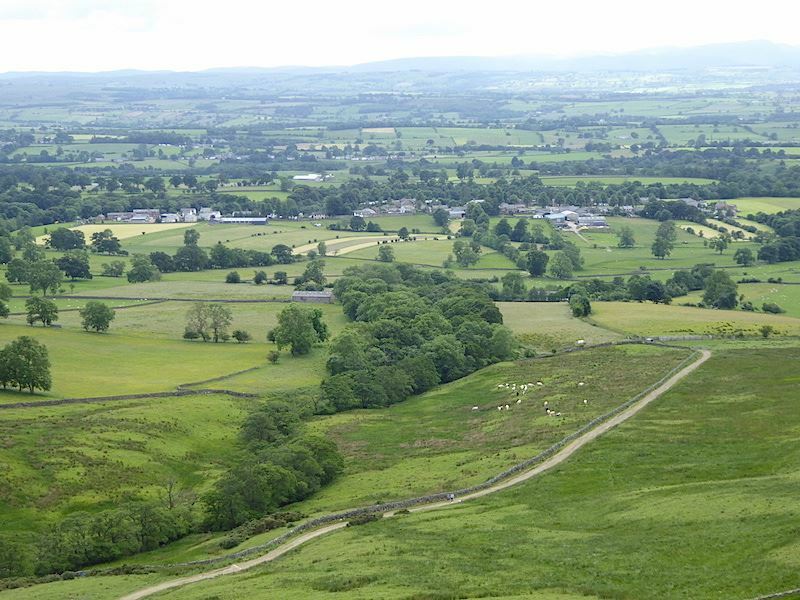 Below us is Dufton village and the track leading back to it. The kissing gate in the wall allowing access to the track is just below us to the bottom right of the shot. 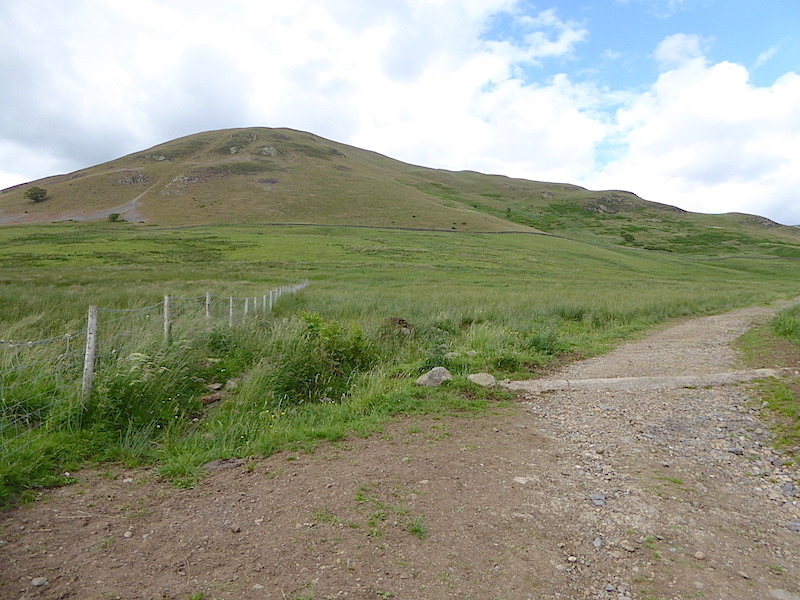 Through the kissing gate and out onto the track so a quick look back at Dufton Pike before continuing. 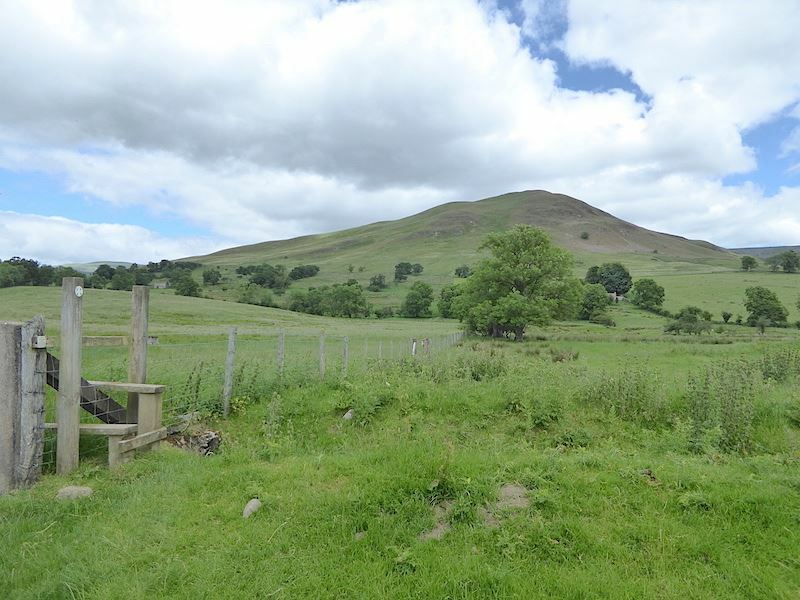 Another look back at Dufton Pike as we reach the gate with a corrugated storage hut, full of farm rubbish, alongside it. Once through the gate we are back onto an old walled lane leading down into Dufton village. Further down the lane I stand on one of the wall stones to get a closer look at High Street, on the centre skyline, with the familiar peak of Kidsty Pike just to the right of it, over on the western side of the Eden Valley. 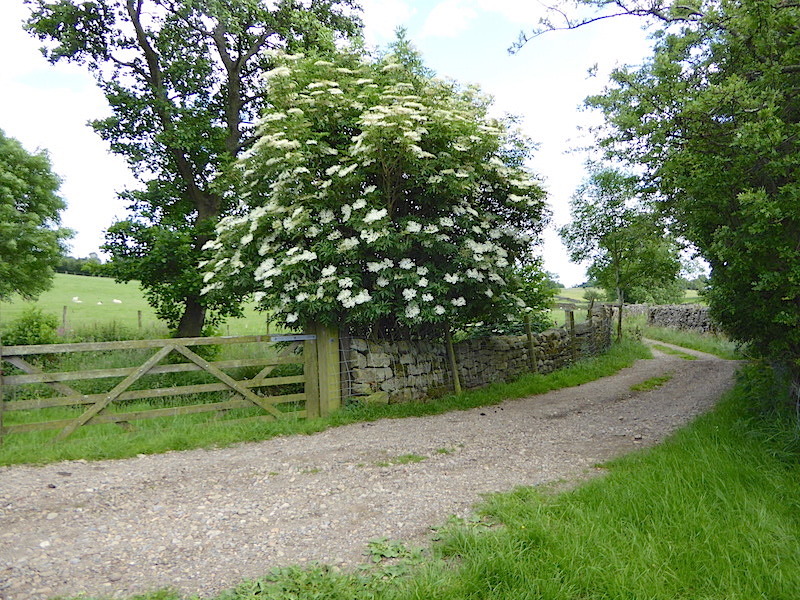 Another lovely lane to stroll through with every elder in full flower, anyone for elderflower cordial? 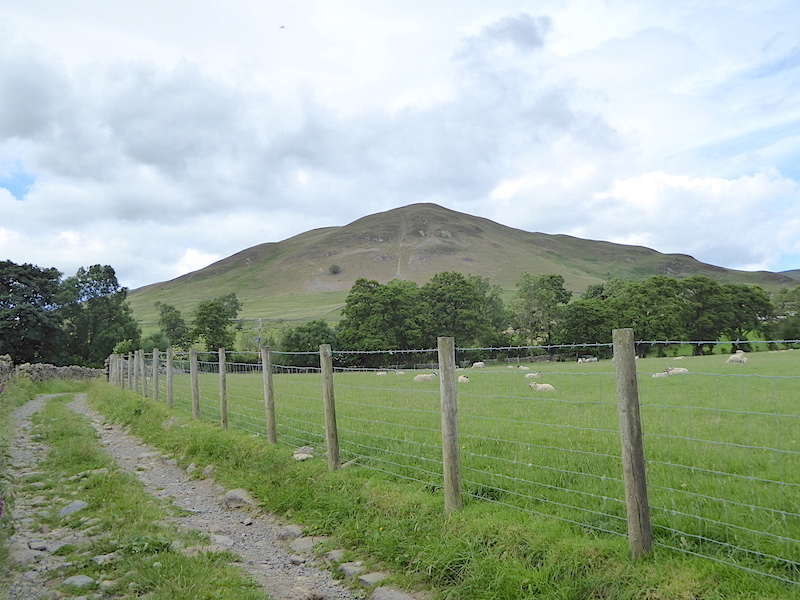 Further along the lane I take a last look back at Dufton Pike, looking conical once again from this viewpoint. 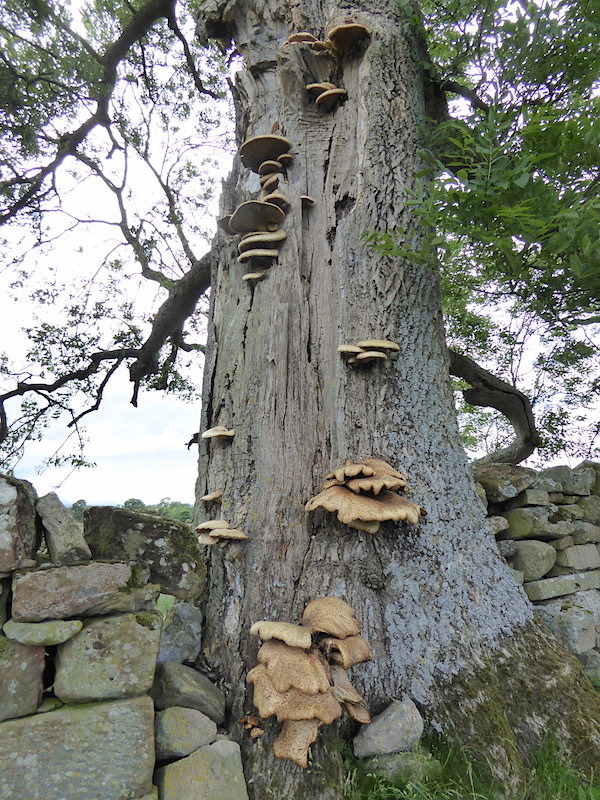 There I was heading down the lane towards Dufton, minding my own business and thinking of nothing in particular, when I rounded one of the bends and came across this partly riven ash tree with its fascinating columns of bracket fungi. 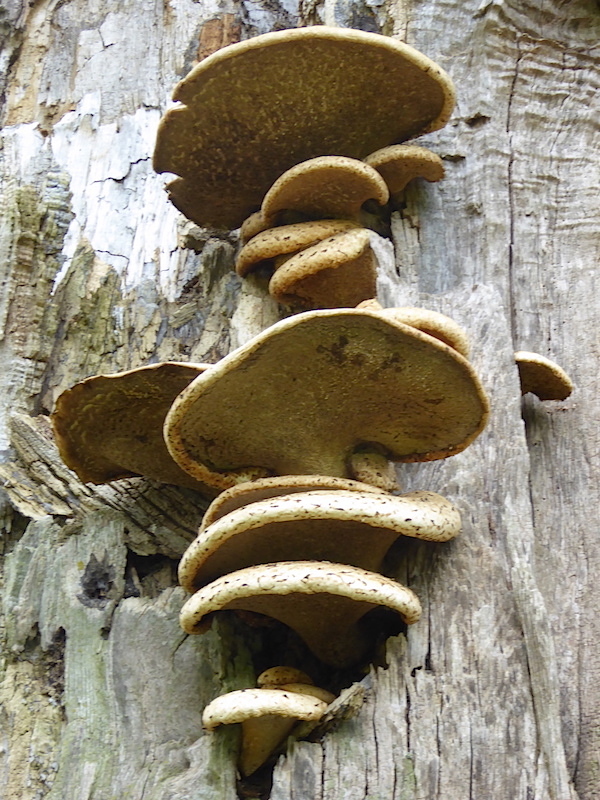 Below are a couple of close ups of them ….. 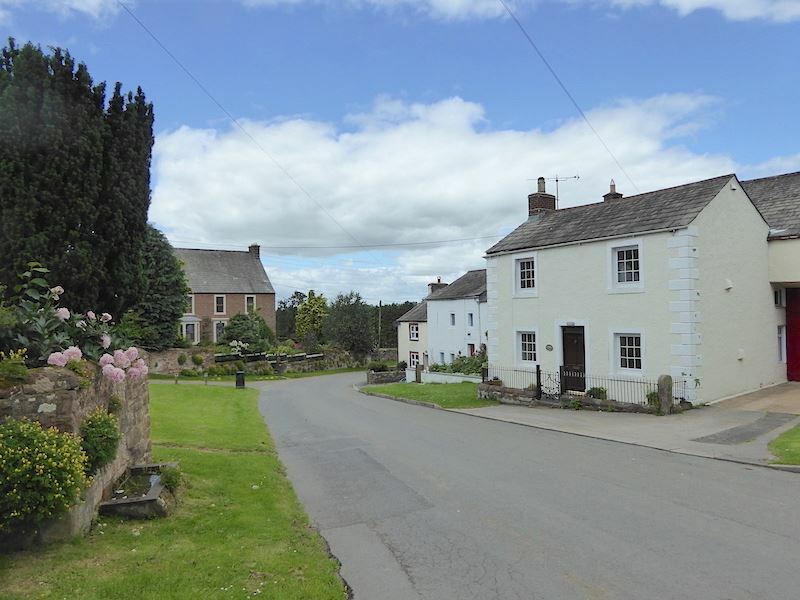 So, we’re back in Dufton village at the end of a very enjoyable and entertaining walk with a view of the old horse trough and the Stag Inn to round things off. The weather wasn’t at its best today but it didn’t rain and if, at the end of a walk, you can stow your stuff in the car boot without a damp, musty and muddy smell permeating the entire car, then all in all you’ve not really had that bad a day.